We are providing one last how to guide for fixing the iBooks crashing error with a different Cydia repository package. Thus, in this tutorial from iJailbreak.com you will learn how to fix the iBooks crashing error using the Insanelyi repo. Note: The Insanelyi Cydia repo has been known to contain cracked Cydia packages and other unethical Cydia packages. iJailbreak.com does not support the Insanelyi Cydia repo, but for the purpose of this How To guide we will need to add the Insanelyi repo to Cydia to be able to download iBooksFix2 Cydia package. Step 1) – The first thing you will need to do is Jailbreak your iPhone or iPod Touch running the iOS 5.0.1 firmware untethered. If you would like help with this process go to the How To Jailbreak Section. Step 2) – The next thing you will need to do is launch Cydia from your SpringBoard (homescreen). Note: You will need to click the Add Anyway button when Cydia warns you about the nature of this source. 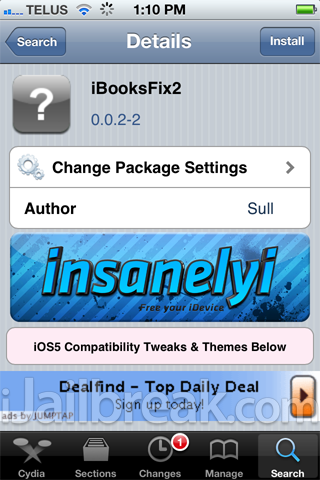 Step 5) – When you see iBooksFix2 on your Cydia search results, click it, purchase it and then download/install iBooksFix2 to your iPhone or iPod Touch. Note: If you followed our last how to guide on fixing the iBooks crashing error you will need to uninstall the old iBooks Fix for iOS 5 package before moving on. Step 6) – Once iBooksFix2 has been installed you will need to click the Return to Cydia button, tap your Home button and you should now see an iBooks icon on your SpringBoard. Tap the iBooks icon and you should notice that iBooks is now working for you while Jailbroken on the iOS 5.0.1 firmware Untethered. Still iBooks keeps crashing on me..
iPhone 4 iOS 5.0.1 redsn0w- Installed iBooks, then installed this fix, then REBOOT (not respring), WORKS! It worked for me ! Thanks for the tip and thanks to the jailbreak dev team ! After install this fix. The iBooks icon disappear. Not working for me either. I’ve tried both the insanelyi and xsellize instructions & neither took. after installing ibookfix2 the whole ibook icon disappear! gosh anyone out there can help me out? I also encounter iBook icon missing after ibookfix2. I believe it is because we used redsnow_b3 jailbreak. Previously I used redsnow_b2 and it works fine with the ibookfix2. 1. Re-install iBooks. Do not launch app. 2. 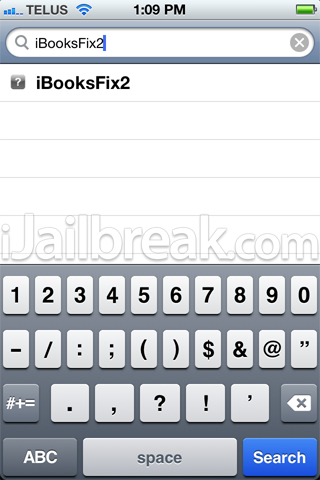 Install iBooksFix2 from Cydia. Re-spring. This worked for me! Just respring, then reboot after everything. 4. Launch iBooks. Read a book. The problem is that after i apply the fix ( ibooksfix2) the icon disappears and i just dint know how to make this thing to work. And by the way the new reds0w jailbreak didnt work eather it just stops. Worked fine for me, if you follow instructions the correct way, and don’t try to skip over anything, it will work, thanks for the fix, it works, its just sad people will get on here and complain after trying to show them step by step lol! Worked for me fine, didn’t before but does now, follow the exact instructions. I followed the instructions to the letter, now iBooks still won’t open and the app is somehow un-deleteable…I uninstalled the iBooks fix, resprung and rebooted, and I’m still stuck with a crashing app and no way to delete it. Any advice/help? Thanks! After rebooting, There is no iBook on my iPhone. followed your instructions to the letter. When I open up ibooks it crashes immediately. I cant remove Ibooks at all now. When i hold down the icon the little x wont show up on the icon. So i cant even uninstall it. how do i remove the ibooks icon now? You cant delete it because its been moved to the root Aplications directory. In Ifile go all the way back to the root folder than enter the Aplications folder (blue one). Inside find iBooks and delete it. Then restart iphone and iBooks will be gone. It would be helpful if you started this walkthrough with “REMOVE iBooks before installing anything.” Now iBooks just crashes immediately. Your idevice will respring, after that it ibook worked like a charm. I hope this works for you. I was having the same problems described all over this thread. I tried Husker1’s example as a last resort and it works…installing Sbsettings did the trick…iBooks finally opens up without crashing on my iPhone. Thanks. THIS IS AWESOME ! After many hours… Husker’s solution DEFINITELY WORKED !… Finally !!! It’s DONE ! Copy it to /Applications/ using either SSH or ifiles. To delete the app, remove the ibooks.app from /Applications/ and you should be able to remove it again. you are a beast, guys do this!!! Ive had trouble for days, tried this exactly now I’m looking at my library filled with books again, thanks!!! It took me hours and you finally solved it in minutes. awesome! Just another note as mentioned before (I’ve since installed the Cydia tweak ibooksfix2 on 4 devices). One device kept crashing until using the SBSettings fix dir permissions (SBsettings->more->system->Fix permissions. iPhone 4, iOS 5.0.1, redsn0w 9.10b3. Tried following the great dirs from Husker1, got all the way to #4 but after reboot noticed that iBooks icon was nowhere to be found. ITunes thinks it’s installed but also does not show it in the representation of the phone (an uncheck and recheck of the app in the list corrects this in iTunes but it will not show on the phone. This is repeatable. I’ve deleted everything (or so I thought), even to the point of deleting the Mobile Substrate. Now I’m stuck and don’t know where to go. Any advice? THIS IS THE WAYsmooth and sweet as a candy! Works on b3 for me now. Had icon disappear problem also. I must have mucked something up on my first attempt. Used ifile to delete ibooks from /applications as instructed a couple posts up, reinstalled ibooks, then ibooks fix2, then installed sbsettings and followed instructions above for same, resprung, put ipad into dfu, then powered back on, works now! Thanks all for the tips! please , tell me ,please!!! Should I delete ibooks APP itunes ? Before i install ibooksFix2 ? I tried the corona untether update 1.0.8. Stil did not work. Shall i add the ibooksfix now, or a rejailbreak via redsnow? On iphone 4. @226aecd9d430f0c2c0d14c9055c2a83c:disqus Thanks a lot, I was missing my books a lot. i thank you my good man! i was going at this for a while now after reading your comment n doing it mine works! I accidentally applied this fix to an Ipad 5.1 tethered jailbreak and now cydia does not work. Any advice how to undo the changes and get cydia working again? I don’t want to reboot my ipad and lose my apps is there alternative to that?